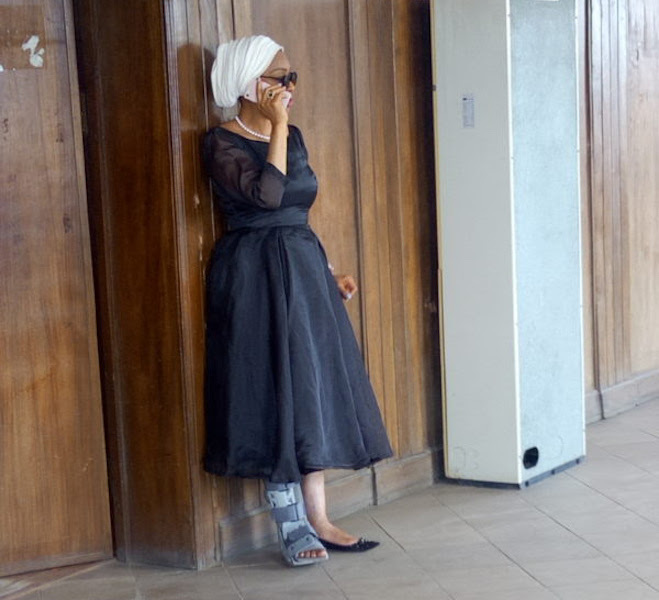 Justice Rita Ofili-Ajumogobia, a dismissed judge of the Federal High Court, seen making a phone call at an Ikeja High Court before being apprehended by the EFCC on Tuesday. There was mild drama at the premises of an Ikeja High Court as officials of the Economic and Financial Crimes Commission (EFCC) apprehended Justice Rita Ofili-Ajumogobia, a dismissed judge of the Federal High Court, after corruption charges against her were struck out. The News Agency of Nigeria (NAN) reports that about 10 officials of the EFCC surrounded Ofili-Ajumogobia as she attempted to leave the courtroom at 10.24 a.m. after the ruling by Justice Hakeem Oshodi. Upon sighting the officials, the judge made a hasty retreat and went back upstairs into Justice Oshodi’s courtroom to seek the protection of the court from the EFCC officials.